Before inviting a new user to your account or individual project, you will need to first configure their access to certain tools and features within the 3Play Media application. See more information on inviting users to your 3Play account or individual project. The following article explains the features and tools you can enable or disable for each invitee. Turn Manage Users on if you want to grant your invitee access to invite, remove, and edit other users' permission settings. Turn Manage Invoices and Billing on if you want to grant your invitee access to view invoices and make payments. Note: This feature may not be visible if you are inviting a user to an individual project unless you have had 3Play Media configure your account for project-level billing. Turn Upload on if you want to grant your invitee access to upload files for all 3Play Media services including transcription and captioning, alignment, and translation. Turn Edit on if you want the invitee to be able to make edits to files. 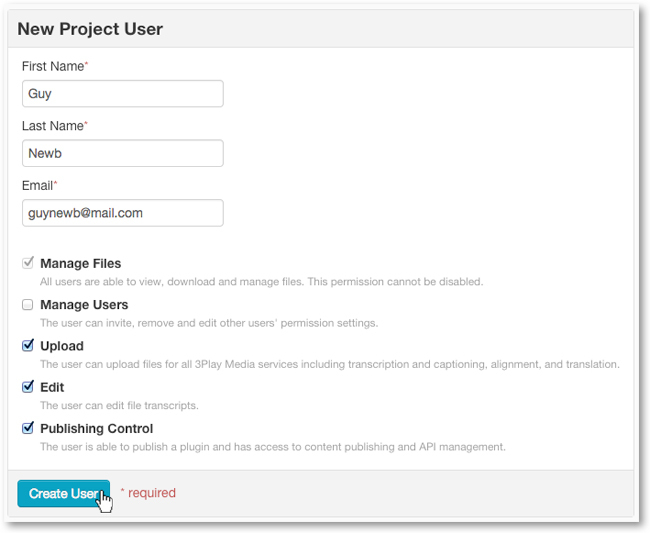 Turn Publishing Control on to enable the invitee to publish a plugin and have access to content publishing and API management.